AKA: PS-2. Status: Operational 1957. First Launch: 1957-11-03. Last Launch: 1957-11-03. Number: 1 . Gross mass: 508 kg (1,119 lb). After the surprise public impact of Sputnik 1, the satellite and launch teams were called back from vacation and in one month assembled Sputnik 2 (using equipment already developed for dog sounding rocket flights). The spacecraft, which remained attached to the upper stage, carried the dog Laika. No recovery was possible, and the dog perished in orbit due to higher-than-expected temperatures. The life-support system and the consumables were designed for a 7-day flight. Control of the internal atmosphere was provided by a carbon dioxide absorbing device, an oxygen generator, an oxygen regulator, and a fan that activated when the cabin temperature went above 15 deg C. Food and water were ejected by tube directly into the stomach in jelly form, and wastes were removed by another implanted tube. Restraints kept Laika from moving far -- she could not even turn around. Her electrocardiogram, and data on respiration rate and maximum arterial pressure, were radioed to the ground when over the Soviet Union. Some kind of device (a crude television monitor?) allowed her movements in the cabin to be seen. Three dogs -- Albina, Laika and Mushka -- were involved in flight preparations. Albina was the back-up dog, and had survived earlier sounding rocket flights into space. Mushka was the stand-in for tests. All the dogs had been trained to survive in small cages in preparation for the flight. Laika was sealed into her cramped cabin four days before launch. Despite her ordeal on the ground she survived the launch and her heart rate returned to normal after a time. She had proven that an animal could survive in sustained spaceflight. But in practice the environmental control system was not up to the task. Telemetry showed that temperature and humidity increased relentlessly. By the fourth orbit none of the physiological sensors were returning data -- Laika had evidently died. This fact was not revealed until the 21st Century. Family: Biology. Country: Russia. Launch Vehicles: R-7, Sputnik 8K71PS. Launch Sites: Baikonur, Baikonur LC1. Agency: Korolev bureau. Bibliography: 110, 177, 2, 21, 6, 6933. 1957 November 3 - . 02:30 GMT - . Launch Site: Baikonur. Launch Complex: Baikonur LC1. LV Family: R-7. Launch Vehicle: Sputnik 8K71PS. Sputnik 2 - . Payload: PS-2. Mass: 508 kg (1,119 lb). Nation: Russia. Agency: MVS. Class: Biology. Type: Biology satellite. Spacecraft: Sputnik 2. Decay Date: 1958-04-14 . USAF Sat Cat: 3 . COSPAR: 1957-Beta-1. Apogee: 1,660 km (1,030 mi). Perigee: 212 km (131 mi). Inclination: 65.30 deg. Period: 103.70 min. Carried dog Laika. Study of the physical processes and conditions of life in outer space. After the surprise public impact of Sputnik 1, the satellite and launch teams were called back from vacation and in one month assembled the satellite (using equipment already developed for dog sounding rocket flights). After the launch, Soviet space officials said that the spacecraft would not return and that the dog had enough food and oxygen to live for up to 10 days. Only 45 years later was it revealed that Laika overheated, panicked and died within 5 to 7 hours of launch. 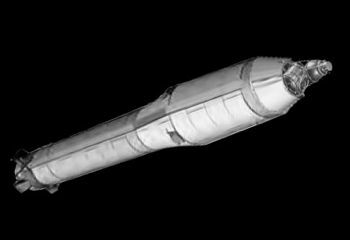 What turned out to be the first space crypt remained in orbit a total of 162 days, then burned up in the atmosphere on April 14, 1958.